The datum position is the position where the blade stops between cuts. This is factory set & normally shouldn't need to be adjusted by the machine user. However, if you find that your blade stop position has changed, then please follow these instructions. The optimum position is 180o opposite to the guide bushes (see photo to the right). For free-standing cutters (right-to-left feed) this means the blade will be at the 3 o'clock position when looking at the blade side on. For combination machines (right-to-left feed) the correct position is at 9 o'clock. For left-to-right feed machines, the opposite positions apply. Go to the Tools or Setup screen to adjust the stop position. The datum field on this screen will allow you to enter a new value for the blade stop position. Please refer to the operating manual that came with your machine. 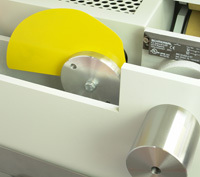 Alternatively refer to the FAQ section relating to your Servo-Torq® cutter model & version. You should be able to download a PDF copy of the manual. If not, please contact our Tech Team (details below). Disconnect the electrical supply from the machine! Remove the guard cover over the cutter servo motor. There will be a toothed timing belt running from a pulley on the servo motor to a pulley on the knife shaft. Slaken the timing belt tension. To do this you may need to loosen the bolts holding the servo motor in position. Fit a knife blade & manually set it to the correct datum stop position. Adjust the timing belt on the knife shaft pulley to do this. You may need to jump one or more teeth to do this. Please take care when handling the knife blade! We recommend you wear suitable safety gloves whenever you are handling the blades as they are very sharp! Re-tension the timing belt by adjusting the cutter motor position. Retighten the cutter motor bolts. Replace the guard cover over the motor. Reconnect the power & test the machine.